As we all know, calendars play an important role in our daily life. They can help people manage their personal schedules, and activities. As some calendars are simple, monotonous, and are inconvenient to flip, you may usually ignore them. However, a calendar shelf may make your calendar eye-catching, thus helping you to identify days, typically to agree on a future event. 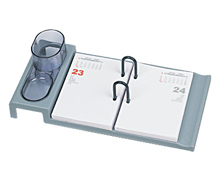 As a calendar shelf manufacturer in China, we mainly produce two types of calendar shelf for customers to choose from. Our calendar shelves are innovative in design, attractive in appearance, and easy to use, which are ideally suited for office and home uses. Use Deli calendar shelf to enhance your taste. Besides calendar shelf, we also produce other office products like notebook, fax paper, copy paper, book end, color palette, and more. Due to our consistent dedication to product quality and environmental protection, we have received the ISO9001:2000 and ISO14001:2004 certificates. Our company is located in Ningbo, Zhejiang, thus we have easy access to convenient air, land and sea transportation, thus making transportation more economical. For more information about our products, please feel free to contact us! We promise to provide you with high quality products!